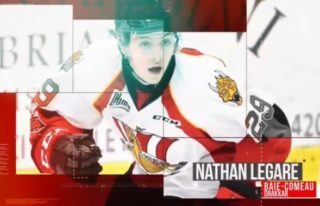 Forty of the CHL’s top 2019 NHL Draft prospects are preparing for one of the biggest games of their young careers on Wednesday and one of them hits the ice at the top of the list. Saskatoon Blades forward Kirby Dach came in as the second-ranked North American skater on NHL Central Scouting’s Midterm Rankings unveiled on his 18th birthday Monday morning. The 6-foot-4 centreman from approximately two hours north of Red Deer in Fort Saskatchewan, Alta. will have an abundance of family and friends in attendance for the Sherwin-Williams CHL/NHL Top Prospects Game. “It’s a feather in your cap, but at the same time you can’t let it get to your head or drag you off course,” said Dach of the distinction. “You’ve got to stay focused. There’s lots of players behind me and I’m still not at the top so I think I’ve got work ahead of me and I think that’s the biggest thing. 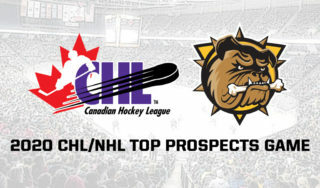 Dach trails only American-born centreman Jack Hughes on the list and is joined by what looks to be the strongest WHL draft class in years with Dylan Cozens (Lethbridge Hurricanes), Bowen Byram (Vancouver Giants) and Peyton Krebs (Kootenay ICE) all following him inside the top 10. Kirby Dach of @BladesHockey continues to climb the scouting boards ahead of the 2019 NHL Draft. Dach leads the Blades with 50 points (18-32–50) over 43 games this season. He’ll wear the ‘C’ for Team Orr as he plays under a coaching staff consisting of former NHL netminder Kelly Hrudey, fellow WHL grad and long-time NHL defenceman Robyn Regehr as well as Prince Albert Raiders bench boss Marc Habscheid on Wednesday. The last Saskatoon player to be selected inside the top five at the NHL Draft was Curtis Leschyshyn, selected third overall by the Quebec Nordiques back in 1988. The way scouts these days are talking, Dach is also in that conversation. Playing out of the WHL’s Eastern Conference, Dach is no stranger to The Centrium. He’s enjoyed a pair of two-point performances in Saskatoon’s two visits to Red Deer this season. “There’ll be a lot of eyes watching on Wednesday, but I’ve had some good games in Red Deer so it’s a nice place to have the event,” he said with a smile. Dach leads the way into the 24th annual showcase that features 30 of the top 62 skaters ranked in Monday’s NHL Central Scouting Midterms. Wednesday’s game gets underway at 10pm ET/7pm PT live across the country on Sportsnet and TVA Sports as well as in the United States on NHL Network.